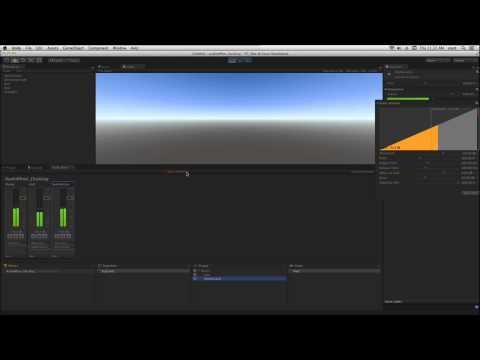 In this lesson we'll look at Unity's Duck Volume audio effect. Duck Volume allows us to cause the volume of an audio signal to duck or get quieter based on the volume of that signal, or a different one. A common use of this effect is sidechain compression. We'll look at how to set up Duck Volume including routing signals to control ducking with Send audio effects. based on the volume of another. using the Duck Volume effect. to different outputs in our audio mixer. based on the volume of the kick drum when it strikes. This is also called side chain compression. using the Add drop down menu. and I'm going to do this using the Send effect. I'm going to click Add and choose Send. for the send to be routed to. we're going to set the send level. adding any volume to our mix. chain input on a compressor. kick will reach the duck volume effect when it plays. Let's listen to the scene first. we can configure it's parameters. gain reduction will begin to occur. before we start to apply any gain reduction. Let's listen to that in action. and we're going to slowly reduce the threshold. or volume of the synthesiser group. which is called the ratio. applied once the threshold is exceeded. Next we have the attack time and the release time. The release time is the opposite. the compression or the gain reduction. so we'll be back to our original signal strength. some of the gain that we've reduced. in volume is going to be applied. The knee controls the behaviour of the threshold. we're going to begin applying gain. as the gain reduction is applied. the threshold has been tripped. even before we've exceeded the threshold. processed by the duck volume. to adjust the threshold value. of how the knee is effecting the threshold.